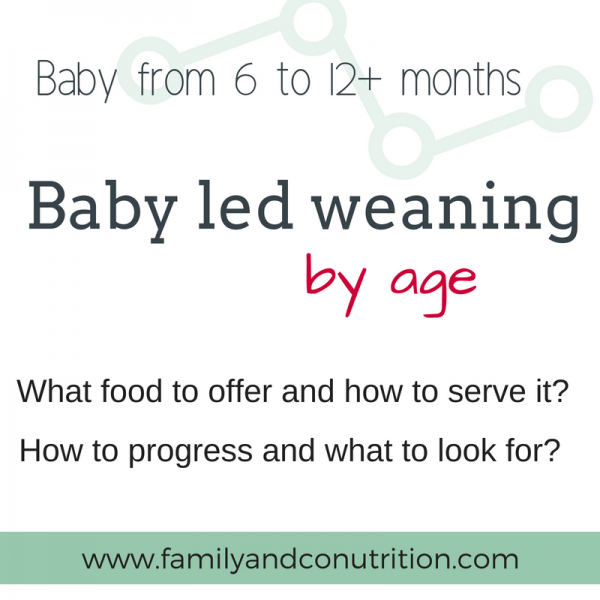 Baby led weaning: It’s messy at first! As parents there are so many decisions you make on behalf of our kids. Try striking up a conversation with any parent on topics like sleeping habits or approaches to solid food introduction and you’ll realize that everyone does it differently. As long as your kids are otherwise healthy and developing normally, there really is no right or wrong method…simply what works best for you and your family. The transition period from exclusive breastfeeding to solid food introduction is an incredible milestone for both parents and baby. One traditional approach is the progressive introduction of textures leading up to solid food. You know…the classic airplane spoon of puréed food where the parent feed the baby. 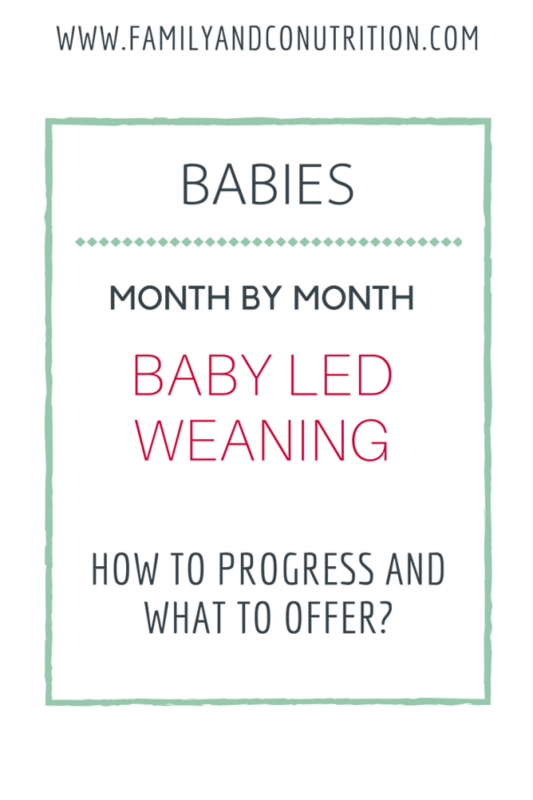 An alternate approach is one where the baby directs and controls the process, formally termed “baby-led weaning” (BLW). Which ever method your family adopts it up to your and baby’s preference. 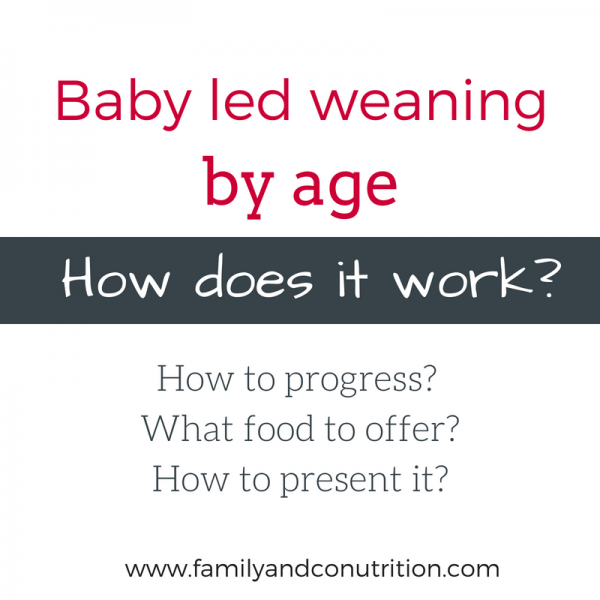 Is baby-led weaning better than traditional weaning? Both methods are adequate and can promote responsive feeding. Parents decide what, when and where to eat, and baby decides if and how much to eat. With both methods, parents should always supervise the feeding time, and serve appropriate non-chocking food options. 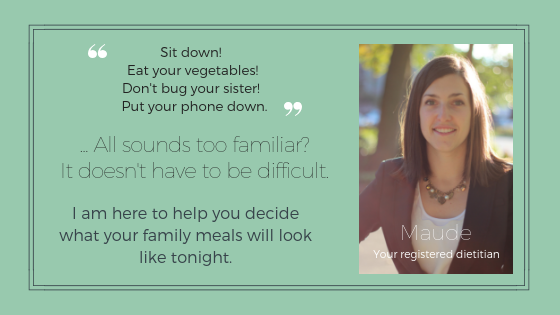 Sharing family meals is the easiest way to do so! 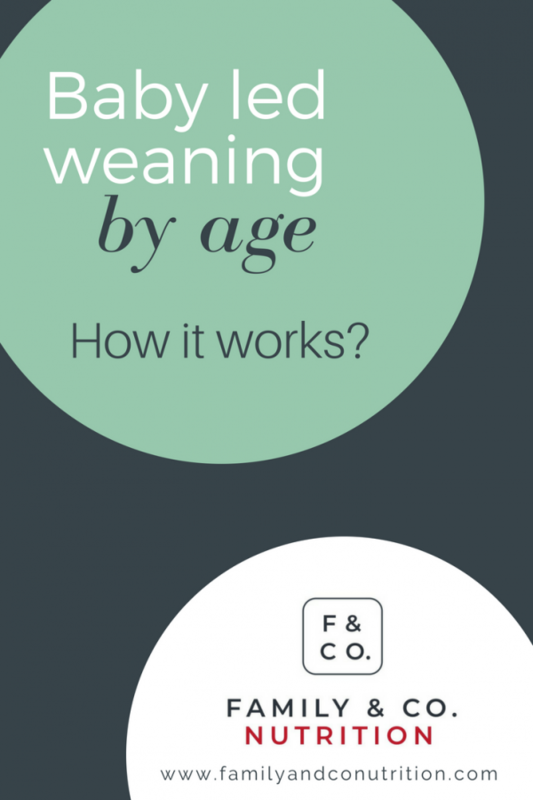 Traditional, baby-led, a mix of both weaning methods…it’s up to you and baby! 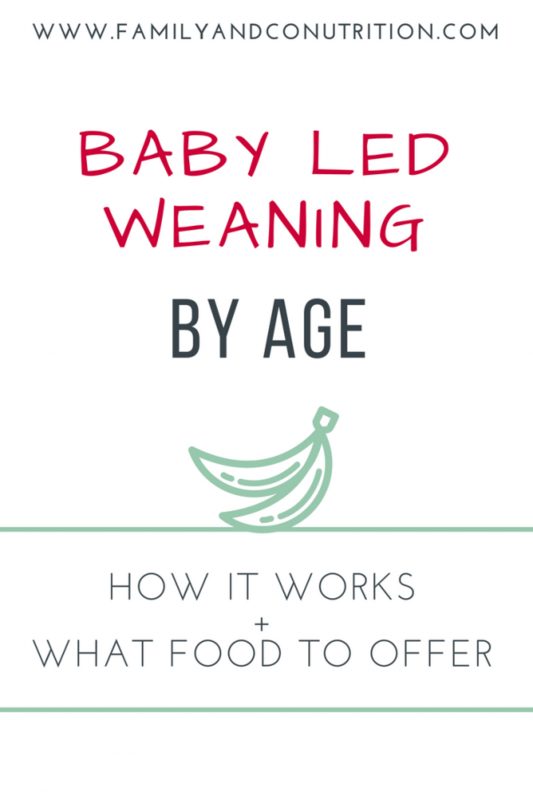 Baby-led weaning by age: it’s gonna be messy, but it will get better! The biggest effort will go into clean up and maintaining order during meals. The reward? Witnessing the evolution of your child’s eating style and relationship with food. And though it may be awesome, it can be frustrating and tiring. Letting your child explore food is an essential part of the learning process, but boy it can be messy! Being messy, part of baby’s development? Mastering all these skills will take months, and the best way to learn is to practice! So arm yourself with patience and encourage your baby to explore and gain skills! The primitive chewing ability of babies is a simple up-down munching pattern. They need to practice and gain the skills to move the food with their tongue, form a bolus that they can push towards the back of their mouth to swallow. This will become feasible when they master the rotary chewing pattern adults have. They will also gain muscle strength to chew, precision of movement and coordination between eyes, hands, mouth, and teeth. All this will help baby to be less messy! Developmental learning stages explain why baby is so messy! Prep all the food and bring the plate to the table. You don’t want to have to leave your baby while they eat. You can leave for two seconds and come back to a total trash party. Bring wet clothes with you at the table. You can clean out-of-control mess, or the floor, or the hair…as baby eats. Use a bib for baby. Test and try different types: with/without sleeves, in plastic or fabric, rigid or soft, with Velcro or snap, etc. Make sure to start feeding baby when s/he is not starving. Offer milk first so that they are interested but not impatient. It will limit frustration and messy behaviour. If they are not desperate for food, they are more likely to explore calmly despite the effort required to master hand-eye coordination. Limit distractions at the table. We suggest no phones, TV and a calm environment. Even family meals can be intense for baby at first. They have new food they want to play with, but they also want to imitate and watch the other family members who are eating at the table. Observe your child and see what kind of setting works best for him/her. Place a computer mat underneath the chair where you child eats. They are sturdy and easy to clean. They are also big enough to catch whatever falls on the floor. Use and easy-to-clean highchair or booster seat. Explore which options you and baby prefer. Do you have space around your dinner table for a big high chair? Is it easy to clean? Is it easy to sit baby in? Can you buy a used one to test it out? Make sure that the seat allows baby to sit at 90 degrees, we don’t want them to be reclined, as this can be dangerous for choking. Choose a time and a place where baby will be able to eat calmly. Arm yourself with patience, wet clothes, a bib and a floor mat! Showing signs of interest such as picking up objects in her/his hand, bringing food to their mouths and/or reaching for food/cutlery from the parent’s plates. This means that around 6 months of age is just a guideline. YOUR child is ready when s/he demonstrates these prerequisites for solid food introduction. Baby is literally learning to eat, as they have been drinking since birth! Around 6 months, your child can move food items back and forth in his/her mouth. Soft foods can be mushed with his/her gums and then pushed backward using pressure, not so much with the tongue. Interestingly, a common early chewing milestone around 6 months is the opening-closing motion with the jaw. Simple but essential! At 6 months, baby is only able to open and close his fist, with limited dexterity. Milk is the primary source of nutrients, so don’t be alarmed if baby only eat a very little amount of food. Offer soft foods: Meat, tuna patties, peanut butter toast, fish, cooked eggs (all the great sources of iron-rich foods), ripe fruit, cooked veggies, avocado, are all good options. These foods can be easily mushed with the gums and manage by your child’s with early-stage chewing skills. Toss slippery food in baby cereal or grounded nuts so baby can easily pick them. Serve home cooked meals: they are the best choices because you can control what goes in it. We suggest no added salt, no added sugar, and no honey. 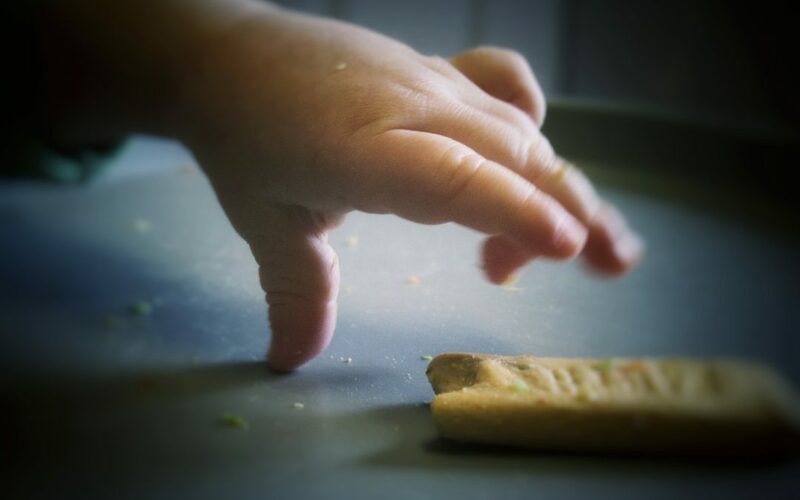 Serve the right food shapes: Cut foods so that it is easy to grab and bring to the mouth: into long strips, or with crinkle cuts, your child will be able to grasp and hold on to them better. Being able to handle appropriately sized food will help minimize choking risk. Serve big pieces of food that baby is able to grab by opening and closing the hand. Offer one meal a day. Milk is the main source of nutrition, so 1 meal is likely sufficient at first. Offer 1 or 2 pieces at a time on the tray: don’t overwhelm your child with too much at once. You can always offer more pieces. Be involved but don’t intervene too much: Sit closer to your child and engage them. Early on they will have very little control and will require their attention for safety. Refrain from intervening when baby is eating; let her/him explore. Talk out loud to and provide guidance “you can grab this piece of fish and bring it to your mouth”, “what does this taste like?”, “do you like the texture of this banana?”, “Is this slippery?”. Practice drinking water from an open cup. Introduce the allergens early on. Lots to discover with solid foods for baby around 6 months of age. Time and practice will get baby better at it! Baby learns to move food side-to-side inside his/her mouth, as well as forward and backward. This is important for progression in introducing food textures. In other words, certain food chunk sizes and/or textures can affect choking risk because your child may not have the oral motor skills needed to safely move and chew the food within their mouth. The tongue is key in this stage for both food movement and protection of the airway. Baby learns how to manage his hand force and to not squish everything s/he grabs in his hands. Milk is still the main source of nutrients, but slowly food is gaining more importance. Make the appropriate food choices: Start to offer the healthy plate. Delicate foods like banana or cooked carrots are easier to manage. Offer 2 meals per day: Aim for 2 meals per day. At that age, milk is still the main source of nutrients but we are slowly transitioning to a family diet (3 meals and snacks). Serve the right food shapes: Continue with strips and integrate soft and delicate food for baby to grab. Keep encouraging drinking from an open cup: continue practicing these mature drinking skills. Baby 7-8 months old is definitely gaining skills and appetite. Offer a healthy plate and encourage the mastering of mature eating and drinking skills. Around this age range, children develop the side-to-side movement of food within their mouths. Baby doesn’t have much problem moving food inside his mouth, and starts to master the rotary chewing pattern. Baby can also lick food off his/her lips. Baby gets better at biting and can contain a bite in his/her mouth. Baby is mastering the pincer grasp, this ability to pick small pieces of food between the thumb and index fingers. Solid food is now the main source of nutrients, with milk being offered during mealtime or breastfed on demand. Serve a range of food textures: Depending on the food texture, the amount of chewing strength and stamina required varies. Mix things up so baby is exposed to various textures. Serve dairy products as is: Dairy products can be introduced at mealtime: cheese, yogurt, milk, and cottage cheese. Although they are a healthy choice, dairy products are dense in proteins and poor in iron, and are not appropriate for the nutrient requirements of young babies. Baby 9-12 months old master the pincer grasp and can manage a wide range of texture and size of food. Motor skills between 12+ months: baby is a pro but might learn that being messy gets your attention! Baby eats like a pro and likely has more and more teeth, helping with the chewing. Offer 3 meals and snacks every day. Baby should eat like the family. Now that baby masters the fine motor skills, s/he may be naughty to get parent’s attention. A new challenge begins! Cichero JA. Introducing solid foods using baby‐led weaning vs. spoon‐feeding: A focus on oral development, nutrient intake and quality of research to bring balance to the debate. Nutrition bulletin. 2016 Mar;41(1):72-7. Brown A, Jones SW, Rowan H. Baby-led weaning: the evidence to date. Current nutrition reports. 2017 Jun 1;6(2):148-56. 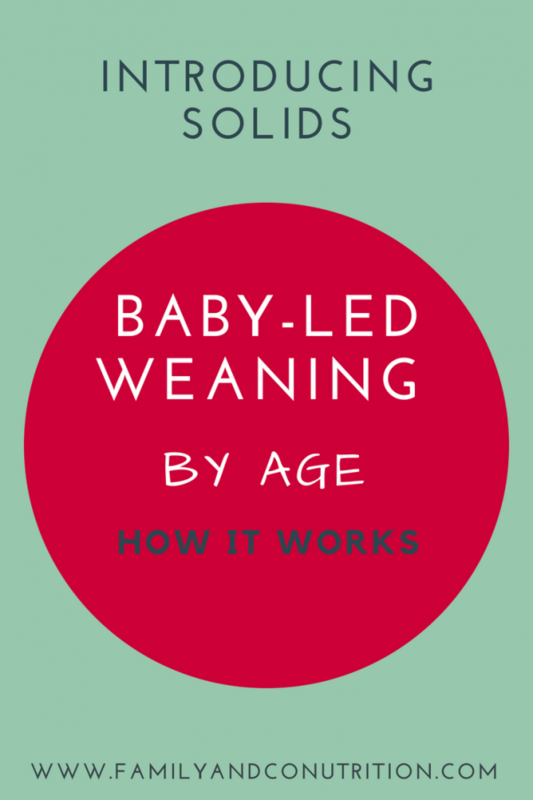 Most, L. Baby-led weaning: A developmental perspective. 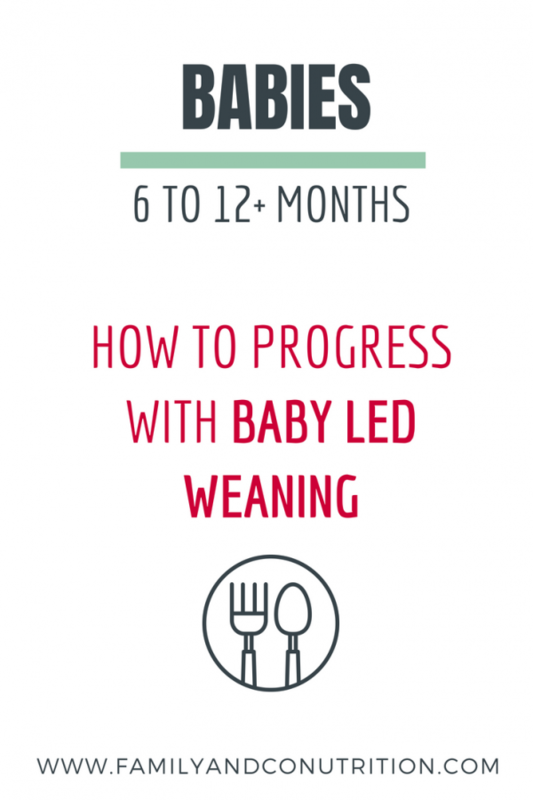 Retrieved from https//txteam.com/2017/11/06/baby-led-weaning-developmental-perspective/ on July 30 2018. Weight gain during pregnancy is expected. Your weight is an indicator of how baby grows, but do you really have control over it?